Wax Try-In SUCCESS! | iweardentures! I literally just walked in the door and could not WAIT to update! I am beside myself, ecstatic about the results. I was so nervous that we would have to go another round, I honestly wasn’t expecting to sign off on the teeth today. My sister has gone with me for the last couple appointments but she is in the hospital recovering from surgery so she wasn’t able to make it. I really didn’t want to go by myself. She said, “Why don’t you just reschedule?” and I told her, “They probably won’t be right anyways so I might as well just get it over with”. Cynical, I know…..I know….. I promise I felt like putting the teeth in my purse and hauling tail out of the office LOL. I really feel like the slight imperfections add character this time, rather than cause a distraction. The vertical length is on point. The shape, size, and color are exactly what I wanted. The position of the teeth are straight, but not so straight they look like piano keys. All in all, I am completely satisfied with the try-in. There was definitely a shock factor there. At first I really didn’t know what to think because they are SO different than what I have now. It was a lot to take in. After the initial shock wore off, I tried to pick for any imperfections but really couldn’t find any. I was just completely satisfied. I video called my husband at home to see what he thought and he was very impressed. I sent all of these photos to my sister and her words exactly, “If those aren’t the best looking teeth EVER!” She even sent a picture to her co-worker and her response was that they looked awesome. Before I signed the consent form I made sure that aside from the appearance, if there were any problems with the fit we could fix it. The wax try-ins felt a little bulky on the top right where the canines are but she said that is just how they are in wax form and that they will not be as bulky once the permanent set is made. How do I feel? Relieved, that’s for sure. But also, it’s hard to imagine that two years ago I had the worst teeth I have ever seen and now I am going to have (literally) nicer teeth than anyone I know LOL. Funny how that works out:-) I wish I would have gotten decked out for the pictures because I felt totally fabulous. I will be picking up my permanent set Thursday morning. It cannot come fast enough! Not only can I not wait to have a totally gorgeous smile, I also can’t wait to once again have perfect fitting dentures. No adhesive, no cushion grip, no disastrous home relines and crack repairs. I just can’t wait. All adjustments need to be made while the teeth are in wax form. If you notice something you don’t like, point it out. 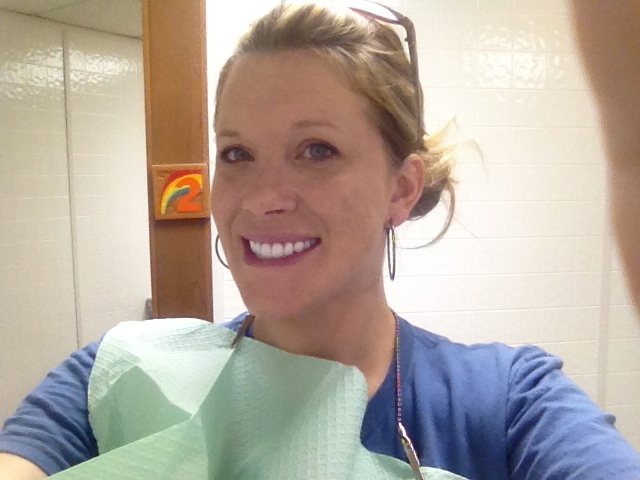 Ask the dentist or assistant if you can have a moment alone to process everything. It’s really difficult to figure out what you like or dislike about the teeth when someone is hovering over your shoulder, eagerly waiting for your response. 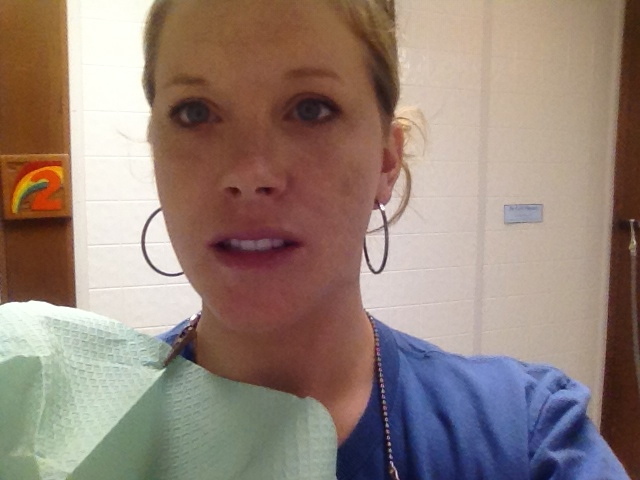 Having a moment to yourself to make goofy faces and really inspect the teeth is CRUCIAL. Speaking of goofy faces, MAKE THEM! Make yourself look as ridiculous as possible. This gives you a better view of the gums and things you otherwise may not notice if you just look relaxed. Smile BIG! I mean, really…..HUGE. Laugh hard. Pretend someone is tickling you or you were told the funniest joke you have ever heard in your life. You want to see how the teeth are going to look in real-life scenarios. Relax your mouth. Give your “expressionless” look. 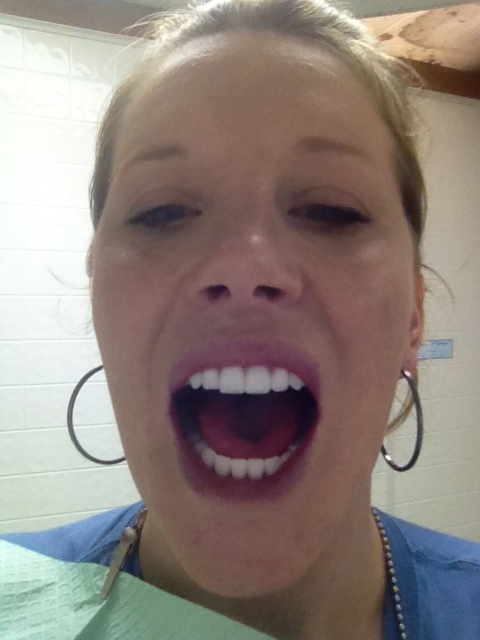 This is the best way to determine if the teeth need to be lengthened or not. If your teeth are hiding behind your lip (common problem with lower dentures) or if your relaxed mouth has a collapsed appearance, something needs to be adjusted. Investigate your side profile. What looks nice from the front, may not look nice from the side. Pay attention to your midline. You can’t really judge by lining it up to your nose because, like me, you may have a crooked nose. Positioning the midline straight down the center of your face might not always work. For me, I just knew what looked off and what didn’t. 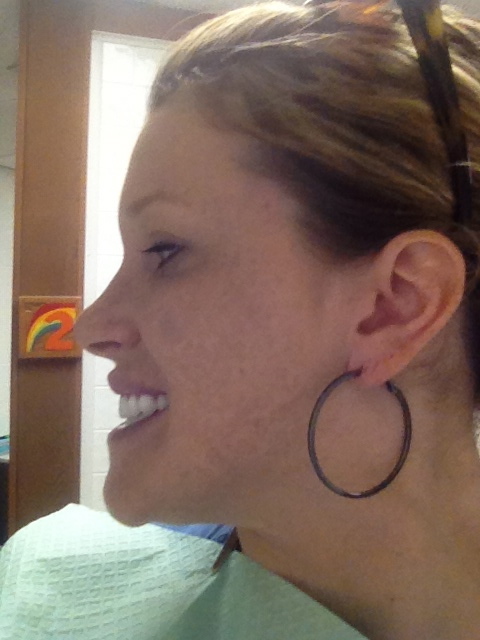 But you definitely don’t want a front tooth centered perfectly below the dip in your upper lip. Feel for a proper bite. If anything clicks or if you feel something isn’t lining up right, this is a problem that needs to be corrected now, not after you get your perms. If your teeth are not properly supporting either of your lips, they can always be adjusted or slanted forward to provide more support. Again, this is something that needs to be corrected now. Take pictures if you are able to. Take pictures of what you look like now, then do all of the same poses with your wax try-ins. Having a point of reference makes it easier to compare the teeth and figure out what you do and don’t like. If possible, bring a friend. An unbiased opinion is always best. They can see things that you may not be able to see, especially if your emotions are running rampant. 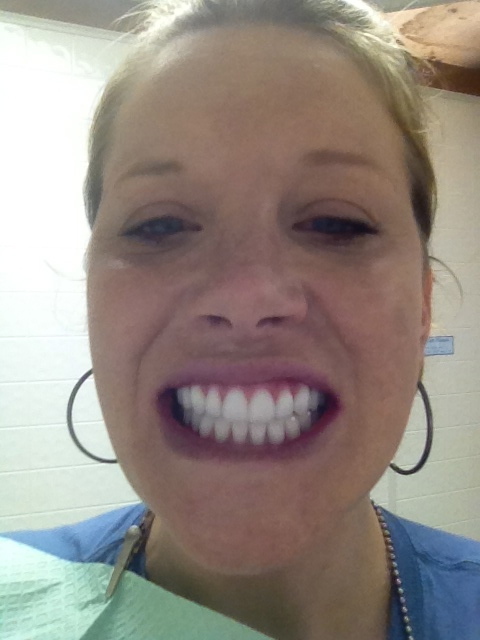 Of all the advice I can give, this is the most important piece: DO NOT sign off on teeth that you are not happy with. Don’t let the dentist tell you what looks good and what doesn’t, he’s not wearing them, you are. It’s ok to get their opinion but ultimately, you have to be satisfied with them. If the dentist tells you the teeth look perfect but you think they are too small, too big, too long, too short, etc, then they need to be fixed. Once you sign off on them, that’s usually it. You are stuck with a set of dentures that you are less than thrilled with. I went for maybe 4 or 5 different wax try-ins and was totally prepared to go for more if I felt like I wasn’t satisfied. I will leave you with my super-goofy video. Can you tell I am a little bit excited? The color you went to is an amazing difference! I am so glad you changed them to this brighter white. They look incredible! AWESOME! thanks for all the tips. I have my first wax tryin on Friday and am freeking out, lol. Absolutely the most beautiful smile evarrrrrr!!! 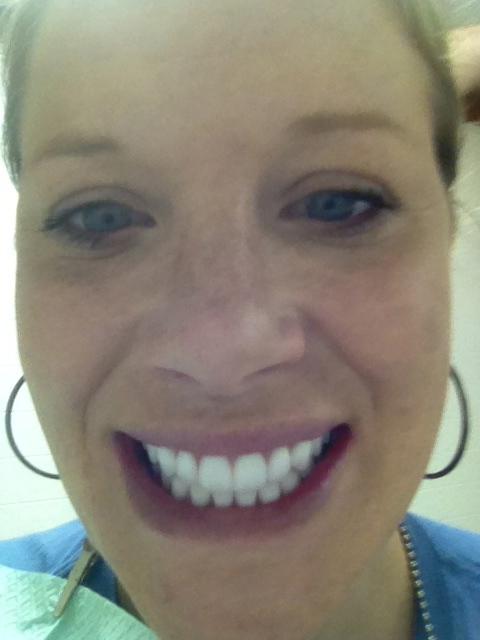 Seriously, I am soooo jealous and refuse to take any pics with you until I get these braces off and whiten my teeth! Like for real don't even try to stand next to me cause i will slap you LOL j/k You look so beautiful sissy! I love you and I'm so happy for you! You deserve the best smile and you got it! So beautiful!! They fit your face perfectly…love the color! Just curious….are they a bleach shade? OMG! I love them!! So those in the pictures are just made out of wax? They're not the actual permanents? So you went to your first was try-in and made suggestions about what you didn't like, and they'd fix it and you came back? You did that 4 or 5 times? Were they getting aggravated? I mean, I would totally do the same, I'm just kinda shy and don't like confrontation so I'm hoping I'd be as forth-coming as you were. I hope the place I go to is patient with me bc I'm just like you, I want them to be perfect! 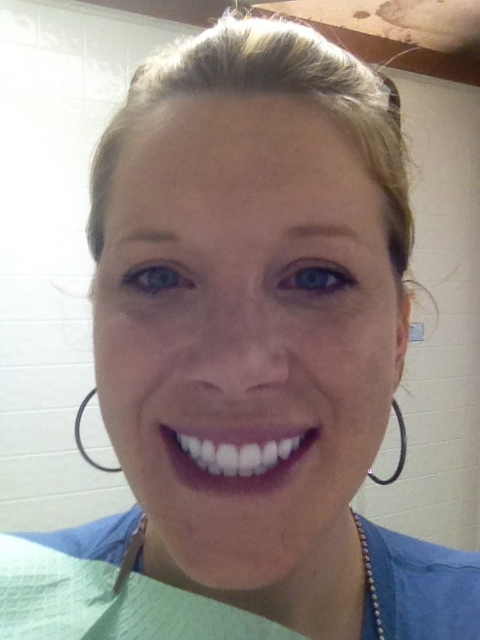 You are absolutely gorgeous and I can't wait to have my new smile!! Thank you so much for all the time you put into your updates and videos. It really does make a difference, you just don't know. 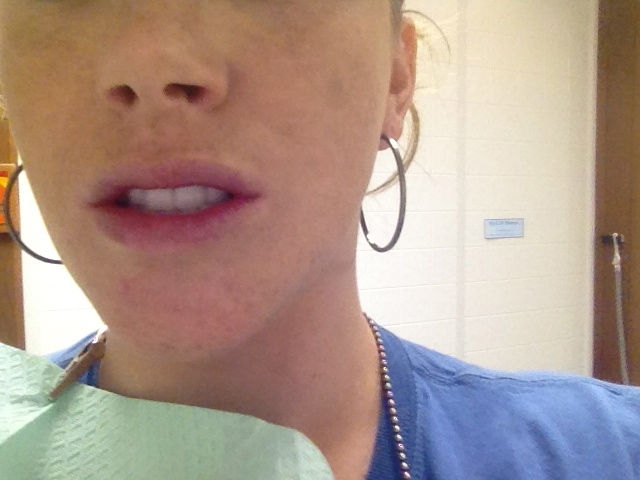 I just left the dentist today, and I'm getting 28 extractions and immediates next Tuesday. I know it'll be a year or so until I have to worry about a wax try-in and getting perms, but I'm trying to prepare myself for everything now. I'm 26, will be 27 next May, so I'm as young as you are and thought I would be a freak show. My husband has been very supportive, and my family, my dad is actually the one paying for it. So thank you so much for all your advice and encouragement! You look absolutely beautiful. And sharing your journey means more than you will know. Thanks so much!!!! Thank you soooooo very much I just got all my uppers pulled and my self confidence is not high right now, but after looking at your pics i'm like wow they really look like your teeth I mean just perfect,I wish I had your dentist lol….in six months I will make sure I am perfectly happy no matter how long it takes after all we are paying for everything…thanks again for your post…i'm still just so amazed going to look at your pics again lol!!! I want to know if they are A1 or B1. Im in the preocess of getting dentures and i really dont know what to choose because i dont want my new teeth look fake but i like yours they look natural. Sorry about my english. I hope u can anwer soon. Congratulations you won and u deserved it. Sorry, this shade is actually PW4. It is a bleached white shade. Than you i really dont know anythiing about it but im gonna tell my dentist. Hey sweet girl your teeth look awesome.I got my perm.dentures in August and they still don't fit but I have not signed off on them either.Dentist blames lab ,Lab blames Dentist.I am a 55 year old woman.I and I finally have these beautiful teeth ..that are useless.Like a lovely pair of shoes you can put on and look at but cannot walk on…lol.My question is although I am in Texas I was wondering if you knew the name of the dental Lab your dentist used? ?thanks for your time. and have a blessed day. Where did you go to have dentures done?? They look the best I've seen. Never mind, found the link on the right margin. Do you still feel the same ?? I am from Texas too -do any of these questions get answered? Going to see my permanents in wax next weekend. So excited! Thank you for helping me through this process. You look beautiful!!!! What dentist made your dentures?? Did a amazing job !! What to know his location?? Can you send them to argentina? thank you! I had all my teeth taken out and bone implants and a sinus lift and the titanium screws put in for the implants and I know that they’re doing wax Impressions now for the dentures that I have to wear until the bone in plants grow and then they put in the permanent implant teeth. Is that what you’re talkin about one versus the other? Cuz I’ve never heard of temporary Dentures compared to permanent dentures. The new ones really do look beautiful on you not that the old ones I’m sure didn’t also cuz you’re beautiful!! Happy for u! Of course the main problem with dentures is that they encourage bone loss. Better a tooth implant, far better. Thank you so much. I’ve returned to this post so many times & each time I go to the dentist to refresh my memory This is the most infomative information you can get in laymen’s terms. Thank you again! How long after you do the wax try in do you get your final dentures. I did my wax try in 9-13-18. I think the wax try in is the last step before the final dentures. I put them in and he made notes on what needed to be fix.